Your home care journey with your aging parent is a precious time. Regardless of the stress that you are likely to face and the challenges that you must overcome, this time with your parent is an opportunity for you to bond your relationship, show your love, and make memories that you will carry with you throughout the rest of your life. May is National Photo Month. This is the perfect opportunity for you to spend some time chronicling your life experiences now so that you can look back on them in the future and reminisce on the valuable time that you share with your aging loved one. Every person sees life a little bit differently and it is always interesting to see just how someone else perceives what is going on around them. Make this something that you can truly experience together and something that you can use as a foundation for conversations and sharing by letting each person chronicle a day or more of life with pictures. Invest in inexpensive digital cameras or even disposable cameras and have your parent, your children, your partner, and of course you take pictures throughout the day. Chronicle whatever matters to you, whether it is preparing breakfast and having coffee with your loved one, your youngest child napping, or a favorite outing. Go through these pictures together and talk about them. Talk about why they took them, what they mean to the person who took them, and what they mean to the others in the family. If your parent is dealing with memory loss such as as a result of Alzheimer’s disease or another form of dementia, pictures can play an important role in supporting memory skills and triggering emotions. Take pictures of objects and people throughout the home and create memory books that your parent can go through to jog their memory. Go through these together often and discuss the types of thoughts and memories that each picture brings up. This can also be an effective means of helping your parent to maintain more independence later in life. Taking pictures of how to do things can help guide your loved one through activities so that they are more likely to follow through with them on their own. 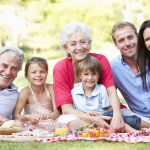 It is always a precious time when you can have multiple generations of a family together. Plan a picture that has all of the different generations together, particularly if you can get a picture of all of the women of the family or all of the men of the family together. You will all treasure this image for years to come. The loss of special photos is truly devastating. Protect yourself from this by making sure that you preserve them properly. Do not just rely on a computer to hold your pictures. Make sure that you store them in a cloud storage facility as well as on an external hard drive or flash drive. If you print them and put them in a book, make sure that you use proper acid-free materials to guard them against degradation during aging. For in-home Home Care in Collierville TN, please contact the caring staff at Personal Care Services MidSouth today! This entry was posted in Home Care Collierville TN and tagged Home Care Collierville TN. Bookmark the permalink.